The weather could not have turned out any better as it did in Ramsgate on Saturday 5th July 2014. Just in time for the 5th Teddy Bears Picnic Extraordinaire. 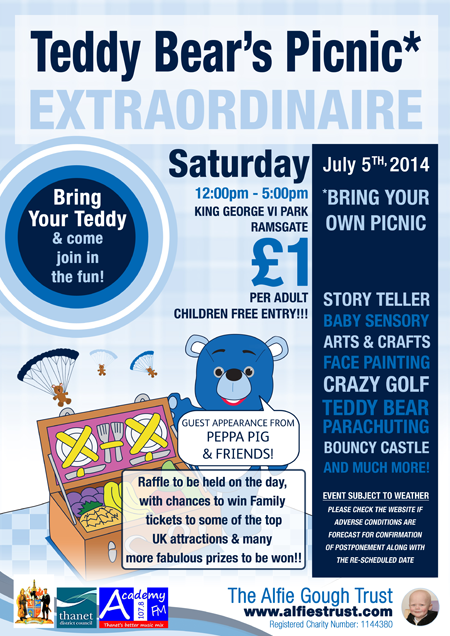 This year’s event was a huge success with families flocking from across Thanet with Bears and Picnics to the King George VI Park. The crowds had visits from Princess Elsa and Olaf the Snowman from Disney’s recent film Frozen. Mickey and Minnie Mouse, Peppa Pig, The Alfie Gough Trust Mascot bear Bo Bo and Even Darth Vader paid a visit from the darkside. Kent Kite Flyers provided a fantastic opportunity to Children to parachute teddy bears from the sky. Other attractions included Horse Riding, a demonstration of life saving skills from St John’s Ambulance, and multiple football tournaments being held courtesy of Margate Football Club and their inflatable football pitch. Reptiles could be viewed for a donation and a display of a Snowy Owl , Harris Hawk and a little owl were all on display provided free of charge. Bouncy Castle, Sumo Suits donated by Atlantis Entertainment and even Balloon modelling along with Arts and crafts and face painting all made up a really fun packed day in the park. The annual event held in memory of local boy Alfie Gough who sadly lost his life to Cancer aged 2 has continued to live on in his memory keeping a real community spirit of fun and happiness in one of our great parks. The organisers work hard with the support of local sponsors to keep everything at low cost and donations to encourage the picnic atmosphere and to thank the community for all the support that was given to Alfie during his battle with Neuroblastoma. The fantastic news for the charity is that this event has reached a new record raising approximately £7,000 to support other children undergoing treatment for Cancer. The Event Arena – Had performances of Peppa Pigs tea party, Ramsgate Rockets Majorettes, Thanet School of Dance, Happily Ever After Meet & Greet Princess, and Toddler Time with Sophie from Helter Skelter. Finishing off with story time to end the day before the draw of the grand raffle. Event sponsors Clancy Docwra, London Array, Southern Water, Ramsgate Town Council, Thanet District Council, Keel and Morrison’s all contributed to the success of the event which has continued to grow year on year. Clancy Docwra, London Array, Southern Water, Ramsgate Town Council, Thanet District Council, Keel and Morrison’s Local, Happily Ever After, Thanet School of Dance, Imperial presence, Helter Skelter, Ramsgate Rockets, KM charity Team Treasure Chest, Margate football club, Atlantis Entertainment, Nelson’s Riding School, Kent Kite Flyers, Falconry South East, Academy FM, Asda Broadstairs. St John’s Ambulance, Misschilies Photography, Katie Cupcakes and Jerry’s Entertainment for supporting the event. What were the winning raffle numbers?